Every summer I grow poblano peppers, many of which find their way to my mother’s house. She works some sort of kitchen magic on those peppers, and they turn into all sorts of wonderful things (some day I’ll get her recipe for Poblano Pepper Lasagna on Crowded Earth Kitchen, but that’s a recipe for another day…)! 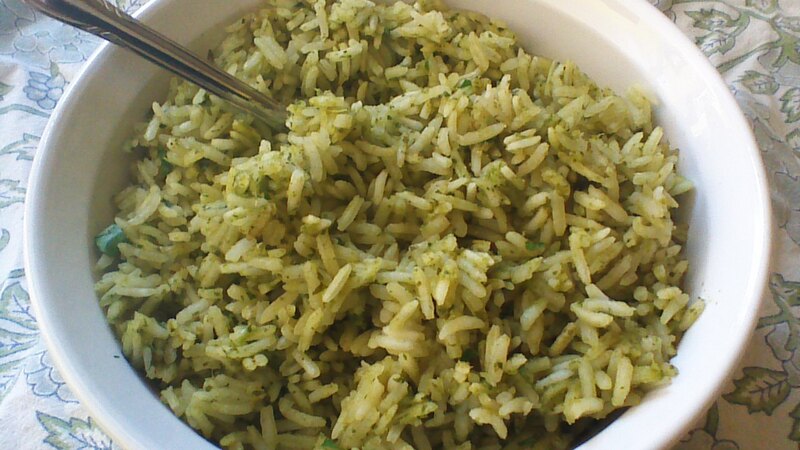 One such wonderful thing is this Poblano and Cilantro Rice. I’m not actually sure if this is her original recipe or if she found it elsewhere. – if it’s not, I’ll post an update with an original source for you. Either way, it’s delicious! Step 1) Roast poblano peppers by either a) broiling for 2 minutes per side or b) holding with tongs over a gas stove burner for 1 minute per side. The peel will bubble and blacken – this is what you want to happen. Place the peppers in a plastic bag for 5 minutes. Peel off the skin (this will be easy) and remove stems and seeds. Chop peppers in large pieces. Step 2) Heat 2 teaspoons oil in skillet over medium high heat. Cook onions and poblanos for 3 minutes. Add garlic, cumin, salt, cilantro and parsley. Cook just a few seconds to combine. Remove from heat and puree with l/2 cup of the chicken broth until smooth. Step 3) Heat remaining 1 teaspoon oil in the same pan over medium heat. Add the raw rice, and cook 2 minutes. Add the puree mixture and cook for a minute or two. Add the remaining chicken broth, stir and cover pan. Reduce heat to medium low, and simmer, without stirring, 10 to 15 minutes til rice is tender. Step 4) Fluff with a fork and serve. Garnish with additional cilantro. This entry was posted in Fruits and Veggies, Gluten Free, Vegan and tagged Cooking, Food, gluten-free, Paleo, Recipes, Vegan. Bookmark the permalink. Thanks for the mention of your old mom. (me, folks). I do love my poblanos! It’s true – you’re way better with poblanos than me!